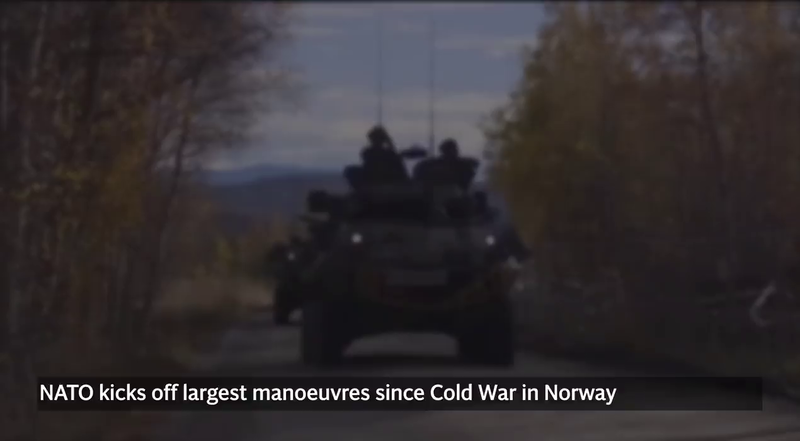 (by Tauren Dyson, UPI) — U.S.-led NATO forces began their biggest military exercises since the end of the Cold War in Norway on Thursday to demonstrate the alliance’s defense capabilities. The exercise, which was announced in June, follows Russia’s move to carry out its largest ever military readiness exercise in September comprised of 300,000 troops. The first Exercise Trident Juncture took place in 2015, when roughly 36,000 personnel from 30 countries engaged in activities in Italy, Portugal and Spain. “If you can train in Norway, you can train anywhere in the world,” Sgt. Robert Durham, of the 24th Marine Expeditionary Unit of the U.S. Marine Corps, told UPI. Durham will join approximately 7,500 U.S. marines at Trident Juncture, more than any other U.S. military branch. 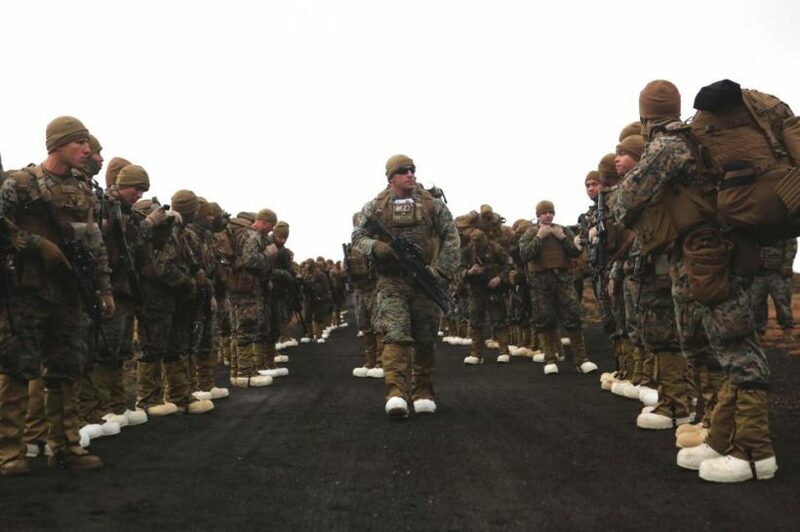 The Marines will work directly with the the Icelandic Coast Guard and the Royal Marines to provide help to rapidly move large amounts of materials from ship to shore. The exercise, however, is not only designed to test the organizational skills of the the allied forces, but also their ability to perform in rough weather. Maj. Rankine-Galloway expects temperatures in Iceland and Norway to range from 35 to 45 degrees, with possible precipitation. These conditions, Galloway said, will help prepare the Marines and sailors to act in combat mission in difficult weather. “Exercises like this make the Alliance better prepared to counter any aggression, if necessary,” Rankine-Galloway said. Trident Juncture 18 is modeled after an Article 5 scenario, a call to action to protect any NATO country under attack. Since NATO launched in 1949, the only Article 5 scenario to occur was in response to the Sept. 11 attack. Some experts think the exercise is a direct response to a potential Russian threat, as tensions between it and the alliance have continued to grow since Russia’s annexation of Crimea from Ukraine in 2014, its continued efforts to destabilize Ukraine, its building military capabilities in the Arctic and its largest ever military exersizes in September. [“Such activity… comes across as provocative, even if you try to justify it as being of a purely defensive nature,” the Russian embassy in Oslo said. During a meeting in Brussels earlier this year, NATO defense ministers presented another plan to push back against future threats. In addition to Trident Juncture, the organization will launch its new “four thirties,” which prepares 30 troop battalions, 30 aircraft squadrons and 30 warships to deploy in 30 days. The plan is scheduled to be in place by 2020. “We have decided further steps to strengthen our shared security and boost defense and deterrence against threats from any direction,” NATO Secretary General Jens Stoltenberg said after the Brussels meeting. Published at the UPI .com on October 25. Reprinted here for educational purposes only. May not be reproduced on other websites without permission from United Press International. b) What is the purpose of NATO? How many member nations are in NATO? c) What is the purpose of the Exercise Trident Juncture 18? How many of the 50,000 military personnel taking part in the joint NATO exercises are from the U.S.? e) What will the U.S. Marines do during the exercises? f) For what reasons is the U.S. participating in Trident Juncture 18? Be specific. 1949 – Belgium, Canada, Denmark, France, Iceland, Italy, Luxembourg, Netherlands, Norway, Portugal, United Kingdom, United States. NATO is a defensive alliance whose purpose is to protect its member states. In response to a changed security environment, NATO continues to enhance its readiness and agility, including through exercises like Trident Juncture. This is to ensure the alliance can counter any threat from any direction. Everything that is done — including military exercises — is defensive, proportionate and in line with international obligations. Combined training and security cooperation efforts enable allies and partners to respond more effectively to regional crises and foster interoperability. The exercise will also include more than 150 aircraft, 70 ships and 10,000 vehicles. An exercise of this scale allows the United States to demonstrate the global reach of the U.S. military, enhances professional relationships, and improves overall coordination with ally and partner militaries during times of crisis. Portions of the exercise will also take place in Sweden, Finland and Iceland. This exercise has air, sea and land elements, and officials say Norway offers the possibility to train realistically in all of these domains. The cold and wet weather will pose additional challenges, but will allow troops to train to operate in extreme conditions. 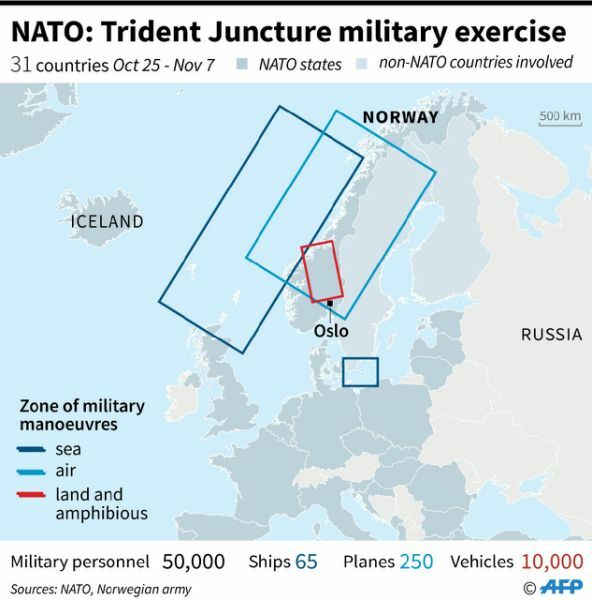 Trident Juncture is designed to test NATO’s ability to plan and conduct a major collective defense operation — from troop training at the tactical level, to command large elements of a NATO force. Although Trident Juncture is not a cyber defense exercise, it will help the U.S. build resilience against cyber attacks and disinformation. 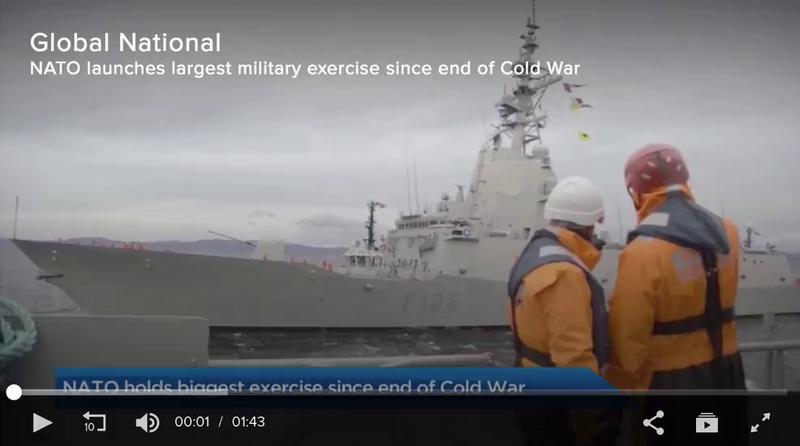 Read about the April 2018 NATO drills in Norway. Did you know that the U.S. pays approximately 22% of NATO’s budget? The other 28 countries fund the remainder. President Trump has called on all NATO members to fulfill their obligations. Which wealthy country has not done so? Read about it here.